Here is what an Apple Car could be like. The chatter about Apple Car went from 0 to 60 faster than Tesla’s Model S P85D, and it is now pretty clear that there is more to it than just rumors. If the sightings of mysterious vans, and the outing of Project Titan, and its team of 1,000 employees didn’t convince you, maybe the high-profile hires will give you something to think about. Among the hires Apple recently made, one name keeps coming back: Johann Jungwirth, former President and CEO of Mercedes-Benz Research & Development. Jungwirth worked on some incredible projects, among them is the Mercedes-Benz F 015, a concept car that might just give us a hint of what Apple could be looking into. 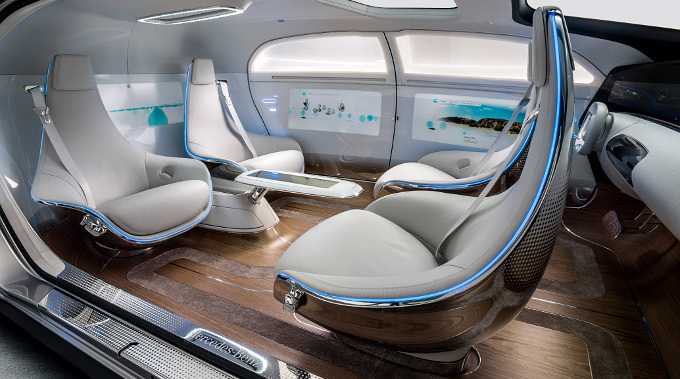 If you can get passed the uber luxurious futuristic look of it, the technology behind the Mercedes-Benz F 015 really is fascinating. It looks like the future, but a future that is right around the corner – not some sort of fantasy dream about what the future could be, but what it will be. Self-driving is of course at the core of the project, which coincidentally goes in line with a report from Reuters published Saturday morning. This entry was posted in iRumors and tagged Apple Car, irumors, iRumorsnow. Bookmark the permalink. Apple scores BBC DJ Zane Lowe to work on iTunes Radio.